LADY AND THE TRAMP, 1955. Original Half Sheet (22” x 28” / 72 x 92 cm) folded movie poster. Starring voice actors: Barbara Luddy, Larry Roberts, Peggy Lee. Directed by Clyde Geronimi and Wilfred Jackson. Story by Ward Greene and produced by Walt Disney. 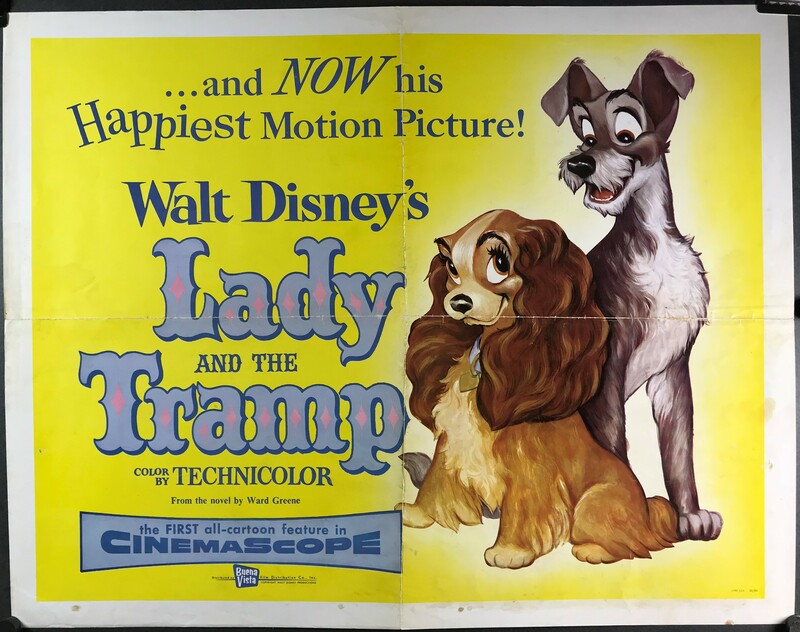 This wonderful romantic family friendly Walt Disney movie issued to theaters in the 50s is nostalgic, classy and is identified by this highly collectible original first release movie poster. This poster is in very good C8 condition with very bright colors, although the fold lines are still visible. There is creasing along side the fold lines, and slight staining in the bottom right corner. There are two very small scuff marks on the bottom right edge. Linen Backing is available for this poster for an additional $60, please add this service to your shopping cart below.